Sportganic™ is adding its top-selling Pre+, a premium pre-workout and pre-event supplement, to health and wellness ecommerce site RonnieColemanNutrition.com. Sportganic™ Pre+ is a caffeine- and sugar-free endurance drink with no preservatives. You don’t need chemicals, caffeine or sugar to get through training sessions or competition. In fact, Sportganic™ is all you need to fuel your performance and endurance for long periods. It contains premium ingredients we guarantee will improve your nutrition profile. Sportganic™ Pre+ contains L-Citrulline Malate, an amino acid that improves circulation through creation of Nitric Oxide, and L-Arginine HCL, which also improves circulation, especially in arteries around the heart. It also contains beet juice powder to increase stamina for improved physical performance, and watermelon extract, which improves the cardiovascular system by reducing blood pressure and hypertension. Sportganic™ Pre+ is a caffeine- and sugar-free endurance drink with no preservatives. The formula is based on 1990s Nobel Peace Prize-winning research of the Nitric Oxide molecule, which Sportganic™ catalyzes and Pre+ is NSF certified for sport. “Our clients include weekend warriors, fitness freaks, gym rats, crossfitters, extreme sporters, endurance junkies, obstacle course fanatics, golf jocks, health nuts, yoga lovers, mountain climbers, professional leaguers and everything in between,” Sportganic™ Pre+ packaging reads. 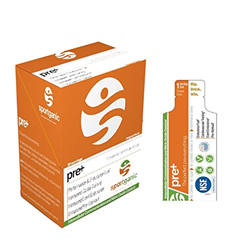 Sportganic Pre+ comes in boxes of 10 and 20 with single-serve pouches that can be easily ripped open and drank. The recommended dosage is one pouch 5-10 minutes before any workout, activity or event. Sportganic™ products are vegan friendly and made from premium, non-GMO materials. For more information on Sportganic™ Pre+, visit http://www.sportganic.com, coming soon to http://www.RonnieColemanNutrition.com.